Against the backdrop of tightening fuel efficiency standards for larger trucks in the US and elsewhere around the world, Sabic has unveiled a thermoplastic roof fairing concept that can potentially reduce annual fuel consumption of a heavy-duty truck by at least three per cent. Sabic’s design concept is aerodynamically optimised to deflect air by accelerating airflow through and across the top and sides of the roof fairing. The result is a dramatic drop in drag, up to 5.9 per cent, significantly improving the aerodynamic performance and fuel efficiency of a heavy-duty truck. Sabic’s new thermoplastic roof fairing concept incorporates air ducts to reduce front end pressure and accelerate airflow both over the surface and through the fairing itself. Conventional roof fairings, in contrast, achieve aerodynamic efficiencies simply by maximising airflow over smooth, closed surfaces. "By improving the aerodynamic performance of this one application alone, fleet operators stand to save millions of dollars in fuel costs each year and over the lifetime of their entire vehicle fleet," says Scott Fallon, general manager, Automotive, Sabic’s Innovative Plastics business. "We understand that reducing operating cost is always a priority for truck operators so we’re excited to introduce solutions like this unique roof fairing concept to help them realise that goal and address evolving needs." 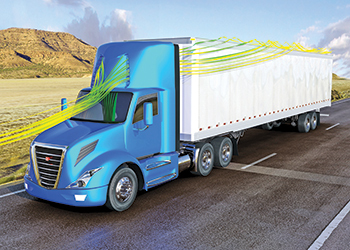 The development of a new aerodynamic solution like Sabic’s thermoplastic roof fairing concept is timely for heavy truck manufacturers and operators in the US. New and demanding fuel efficiency and greenhouse gas emission standards for medium- and heavy-duty trucks beyond model year 2018 are expected to arrive by March 2016. This novel roof fairing concept will also be of interest to truck operators around the world as several other countries and regions have either set new fuel efficiency and emission standards for heavy-duty trucks or are poised to do so. "To meet tougher efficiency targets, a range of strategies are needed," says Fallon. "Our lightweight materials can help reduce the overall weight of a truck, but those savings can be quickly offset by increased payload capacity so we are finding other ways to help the industry realise fuel economy improvements. This is where thermoplastic-based solutions can be game-changing, thanks to the design freedom they deliver to create unique and intricate aerodynamic surfaces and structures like those found on our roof fairing concept." Sabic used Computational Fluid Dynamics (CFD) simulation technology to evaluate and quantify the aerodynamic performance of its roof fairing concept. Specifically, Sabic applied CFD modelling to compare a baseline day cab with dimensions and geometry representative of top aerodynamic designs available today to a day cab featuring many iterations of an injection-molded, aerodynamically-optimised roof fairing. The CFD data helped reveal opportunities to alter the design for improved airflow and reduced drag. Sabic is planning to corroborate its CFD findings with wind tunnel and on-road testing of functional prototypes on a commercial vehicle later this summer. A 3D-printed version of Sabic’s aerodynamically-optimised roof fairing is on display at the Mid-America Trucking Show (MATS) in Louisville, Kentucky from March 26th through March 28th. Sabic is working on a number of other opportunities to improve the aerodynamic efficiencies of heavy-duty trucks with its lightweight thermoplastic-based solutions.